Is Your BYOD Turning into a Bring Your Own Headache? – a BYOD Strategy for Healthcare IT and Beyond. Users in every industry are voyaging more and more to using their own consumer devices. This is the birth of BYO. This is never more true than in Healthcare and Healthcare IT faces some of the greatest challenges in supporting their clinical users in a Bring You Own world. But using advanced technologies from RES Software and Flexera Software you can support your clinicians as they move across a multitude of devices throughout their day, as they roam across the hospital and access their critical healthcare applications and data in a variety of methods. Learn from the experts in the trenches from VDX how to successfully support the new age of mobility across the care cycle, and get IT out of the basement and into the boardroom, where IT belongs. Waterbury Hospital’s mission of providing compassionate, high-quality healthcare services through a family of professionals and facilities drove the organization to address significant hurdles that were impacting the work of the nursing staff. To provide optimal patient care, the nurses rely heavily on access to a combination of applications running on PCs, Citrix® XenApp™ and hosted off-site. While analyzing the current state of its IT environment, Waterbury Hospital uncovered multiple interoperability challenges, remote access issues, long login times and reporting systems challenges. These issues caused significant delays for the nursing staff, resulting in more time spent navigating technical issues that could have been valuable time spent treating patients. Waterbury Hospital implemented workspace virtualization technology by RES Software to streamline workflow and improve overall productivity. Watch the webinar to learn how Waterbury Hospital leveraged workspace virtualization technology to streamline workflow and improve overall clinician productivity. Best practices to automate, manage and secure complex IT environments. technology with traditional IT approaches is reduced. You can offer prospects the ability to manage, automate and secure corporate IT environments, and successfully execute initiatives such as Bring Your Own Device, Windows 7 Migrations, IT-as-a-Service delivery and Virtual Hosted Desktop implementations. Watch the webcasts to find out how. 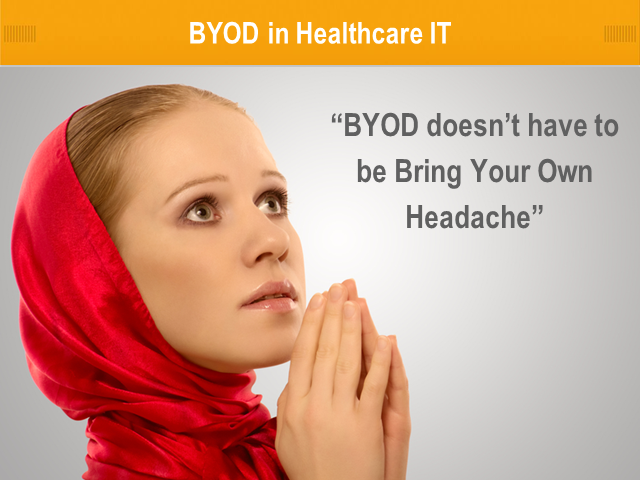 Title: Is Your BYOD Turning into a Bring Your Own Headache?